This is for Janice who read my facebook status the other day when I made this and requested it for the blog. I know that this soup doesn't LOOK exciting, but it really does taste great! Anyhow, I am a fan of 'white' food, pasta, mashed potato, risotto, need I say more? Colour in food is all well and good, but pale and soothing food can be wonderful. Cauliflower cheese is lovely but I am trying to shift a few pounds, pre Christmas so that I can wear this dress and look super girly lovely! 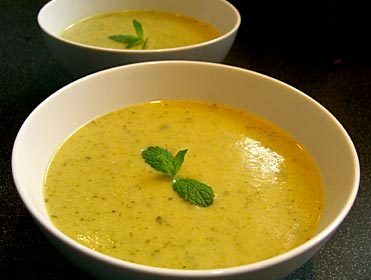 So, I have invented this soup that has all of the taste and a fraction of the fat and calories. Losing weight was never so much fun! Then add the florets of cauliflower and more stock and cook for a further 6 mins. Stir in the grated cheese. If the soup is too thick for your taste, just thin out with more hot stock. Look at this wee chap! isn't he lovely? 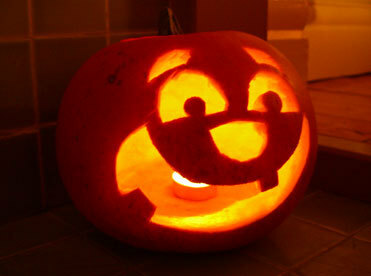 Admittedly not very scary but that was the brief given to Dominic, a pumpkin that I could smile with! Unfortunately we have no windowsill deep enough to display him in, so he sits, smiling away at me from the hearth. Aww! Fry off over a gentle heat the pancetta, onion, sage, chilli and garlic in some olive oil for about 5 mins untl soften and frangrant. Add the pumpkin and cook over a slow heat for about 2-3 mins. Add the stock, bring to the boil and then simmer for 15 mins. Blitz with a hand blender until smooth but with some texture. The other morning, I think it was Sunday, I wanted to make scrambled eggs for brekkie. However, Dom wanted to go for a run and by the time he got back, got showered it was more like brunch time. Sundays can be like this, it’s probably the only day of the week where it seems OK to have two meals rather than three. Probably because there is often the promise of a big roast dinner later on! So, scrambled egg didn’t sound enough. Not in quantity but in flavour. Now don’t get me wrong, I love scrambled eggs with their soft blandness and I rather immodestly think mine are some of the best I have ever had (after much practice, I used to make eggs like rubber! ), but brunch needs more of a kick to it don’t you think? So this is what I came up with, purely from bits and pieces that I had in the fridge and store cupboard. I decided to make something with a bit of a kick, mainly for Dom who embraced curry for breakfast when we travelled to Sri Lanka and loves all things spicy. 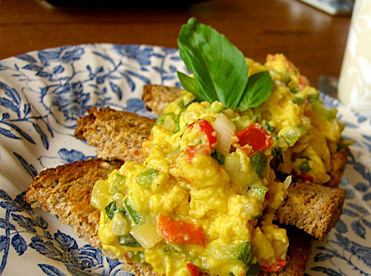 Scramble the eggs by gently cooking the eggs over a low heat until they are a sloppy consistency. Don't over stir, just fold the set egg from the bottom of the pan into the liquid egg. At this point, when they are still a bit runny, be brave and remove from the heat. The heat of the pan and in the egg mixture will do the rest of the cooking. If you keep it on the hob until they look done they will end up over cooked. Serve on top of the toast and garnish with the remaining basil. You could put whatever you have and like into this, peppers would be good, cheese added at the end would be nice, maybe some parmesan? I think if I had had some I would have used coriander over the basil but in a way I was glad it was the only fresh herb I had as it was a nice contrast and not the obvious choice. Make it your own, but make it. It’s dead easy, very quick and would make not only a great brunch but would be a fab quick tea before having to rush back out to meet friends etc. Do you have a dish that you make where the effort that goes in is inversely proportionate to how amazing it tastes? I have a couple and this one in particular makes me feel quite guilty! When I cook it for people I get embarrassed if they ask for the recipe as it’s so simple and requires so few, easily available ingredients that I feel a bit of a fraud. I really MUST do something about my belief that for something to be good or worthwhile it must be hard to do or difficult to attain. Must be my puritanical upbringing (JOKE mother). This dish is something I created a few years ago and was one of the first things that I made up entirely from nowhere but my own head and what I thought would taste good. It was just after I discovered that coriander was actually really nice, after a childhood of disliking it. It also uses fresh chilli and has a wee kick and so went down very well with Dominic. b. You can make it in well under 30 minutes – I’d say you could do it in 15 mins to be honest if you concentrated, didn’t have to root around for the ingredients and weren’t listening to The Archers at the same time. I haven’t really had a name for it until now so…err…. Add the prawns, coriander and lime to the pan and mix together. Cook for minute the turn off the heat so the prawns don't become rubbery. When pasta has 4 mins to go add the peas to the water. 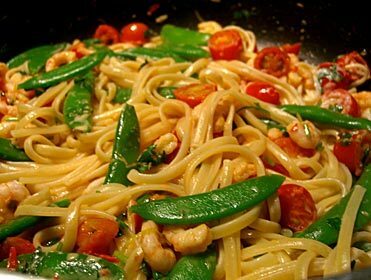 When al dente, drain pasta and peas and add to prawn mixture. Add the crème fraiche and combine everything together. There is a great new café in Newcastle called Supe which does really excellent fresh soups using seasonal and local ingredients. Unfortunately they seem not to have a website but if you are in the area, it’s on Pilgrim Street, near the Tyneside Cinema and is run by two nice young chaps who have lots of energy and passion for food and for offering healthy and delicious alternatives to the usual café stuff you find. Anyhow, I digress. 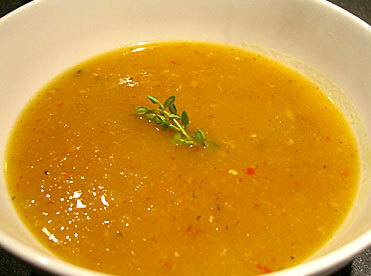 I am writing today to introduce my latest soup recipe, which is a summer soup for a change. And so nice, I might even do it as a starter at my next dinner party. Chop the vegetables up into 2 cm chunks and dice the garlic into little bits. Fry off on a medium heat for about 5 mins until the courgettes are softened and the veggies have a little colour (golden rather than brown). Add the stock and the salt and cook until the potato seems tender, about 15 mins. Add the feta, crumbled up and the mint leaves. Cook for a further 30 seconds then remove from the heat. Using a hand blender whiz until smooth (or use a jug blender if you have one). It turns a really lovely light yellowish green and has a soft, silky texture. 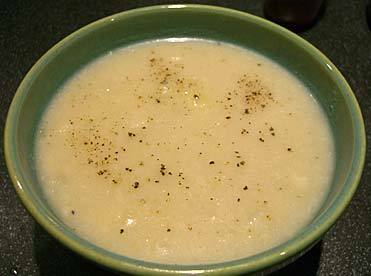 I am really pleased with this soup; it is so simple, with just 5 main ingredients and takes just 20 minutes from chopping board to bowl. We as a nation don’t make enough time for weekday lunches. All too often we grab an unsatisfying sandwich or carton of soup from somewhere and eat it whilst still sat at our desks. Not only is this bad for our health and digestion, it is bad for our souls and our overall happiness. All meals are an opportunity to stop, relax. To talk to friends and loved ones. To daydream, read a book or do the crossword. We Brits need to reclaim our lunch breaks. Get away from our offices or workstations and take time to slowly, thoughtfully eat something that will fuel and uplift us and take us through the rest of the working day. Taking time to make a fabulous lunch is a way of telling yourself that you’re worth it. That’s hard to do with a bought egg and cress on white plastic bread. Yes it takes time, and yes you have to be prepared, but I will gladly trade 20 minutes of TV watching etc in the evening to ensure that I have something to look forward to come 12.30pm the following day. This is a gorgeous lunchtime treat. 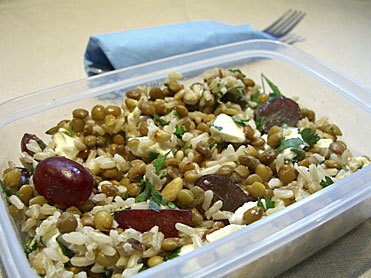 The combination of ingredients may be hard to imagine together but the nuttiness of the rice and lentils, the sharp, salty tang of the feta, the sweet and juicy grapes and the ping of the parsley (See what Sunila has done to me!!) combine to make a salad that is comforting, uplifting and lively all at the same time. Perfect. Cook the rice and allow it to cool. I cook on a very low heat for 20 mins with the lid on, then turn the heat off and let it stand for 10 mins. In the meantime, crumble the feta, chop the herbs and halve the grapes. Drain the lentils. Combine everything in a bowl. Add the lemon juice. Divide into two lunchboxes. Leave until totally cool before putting the lids on. Stick in the fridge overnight and don’t forget to take with you the next day. Nothing worse that getting to lunchtime and realising your lunch is several miles away. Spoken from experience. You can also pack a little bag of salad leaves to eat alongside - watercress would be lovely.